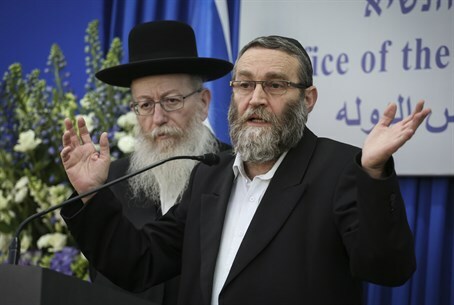 Negotiating teams from Likud and the haredi United Torah Judaism (UTJ) party finalized a coalition agreement draft on Tuesday, making UTJ the first party to reach a deal in coalition talks. Likud representatives will present the draft to Prime Minister Binyamin Netanyahu, while UTJ representatives will bring the draft before its rabbinical council ahead of a final signing of the deal. Earlier on Tuesday the UTJ team stormed out of the negotiating room speaking of a "crisis" in talks over child benefits, in an apparent artificial bargaining trick. UTJ apparently wanted the benefits, which were slashed under previous Finance Minister Yair Lapid, to be brought back to their previous levels, and to have new, larger stipends be given retroactively from January. Likud refused the demands, leading the meeting to end in a stormy fashion. That prediction apparently was spot on, given the agreement draft finalized just hours later. UTJ raised about 70 demands in the negotiations, according to the radio station. The demands that are not acceptable to the other partners are anticipated to be included in the coalition agreement, but in a formulation that is vague enough to keep all parties satisfied.